Developed exclusively for cats and made from reflective materials, the Rogz Kiddycat Harness and Lead ultimate cat accessories set provides your cat with maximum comfort and visibility, while giving you the opportunity to take your pet for a stroll. The designer cat lead is top of the range and the adjustable cat harness is designed to fit any size and is easily secured with the clip clasps. The Rogz Kiddycat Harness Lead, Pink Hearts, is the perfect combination of style and functionality. 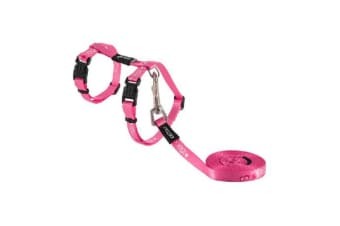 The Kiddycat Harness Lead Pink Hearts is available in the following sizes: Extra small – Harness: 8mm by 20-30cm. Lead 8mm by 1.8m (Kittens ; Small Cats). Small – Harness: 11mm by 24-40cm. Lead 11mm by 1.8m (Most Adult Cats). Rogz is a South African company that manufactures and distributes a wide range of pet accessories. Their specialties include collars, leads, harnesses, toys, beds, id tags and bowls. Rogz strives to stay ahead of the pack and is one of the world’s most enjoyed and respected pet brands! Need a set of ID Tagz for your new harness? The Rogz Scratchie For Metal Id Tagz lets you personalise the ID tags to how you want them!